While at my appointment, the nurse gave me a clipboard with a little survey attached to it, something they give all their postpartum moms she told me. I was to fill it out while waiting for the doctor to come in. It was a how are you feeling sort of survey. Anxious? Sad? Depressed? You were to rate your current state on a scale of 0-3. I read each question, honestly reflected, and circled a 0 or 1 for every question. 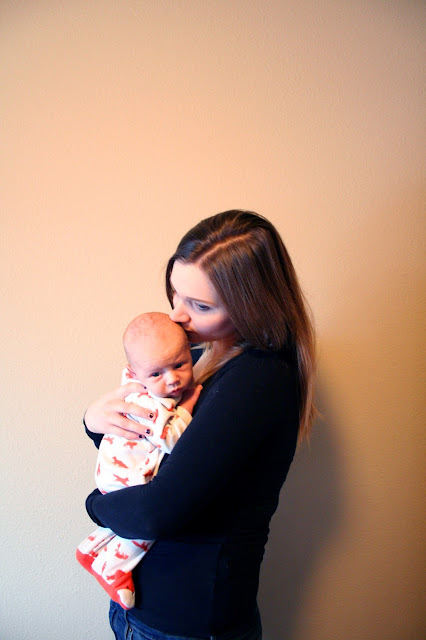 It was not that long ago (though it at times feels like it) when I wrote this post and this post and this post, all describing how draining my pregnant and postpartum months were, that they were so draining they sent my anxiety spiraling which led to a bout of postpartum depression. Those 0s and 1s circled on that survey (that I'm sure is seen as nothing more than protocol) meant everything - freedom, happiness, achievement, hard work paying off. My doctor came in, admitted she was surprised by the scores and asked what I thought was different about this time around. Familiarity? She asked. I told her maybe, but part if felt like just pure luck (or more correctly, grace). I told her this experience has felt so different than my last that it had to be more than just me knowing how to make a bottle. Maybe my hormones are simply on my side this time around. Who knows? I'm not asking questions. What I do know is I'm able to exit the house while able to breathe freely, and I'm able to go see a movie with my husband and enjoy it. No "what if this" or "what if that." It's a gift I am not taking for granted. I'd like to think that this due in part to my hard work over the past year. Therapy, learning how to pinpoint a trigger for the anxiety and learning how to work through it, workbooks, research on the best yoga routines for anxiety, exercise, diet, vitamins, learning how to realize and address my needs without feeling bad about it. I haven't tired in trying to overcome this and I haven't given up. I have to note I was more than hesitant to write this update just 7 weeks postpartum. My diagnosis for postpartum anxiety and depression didn't come until months after having Ella. So I was waiting to see if I would start to feel worse as these last nearly 8 weeks have passed. I've only improved so I thought it was okay to move forward. I also have to note that just because this is my current reality doesn't mean that I don't have anxiety anymore. It took nearly everything to get to the store and back the other day and I can't really explain why - it just got the best of me that day. But what it does mean is I'm freer than I was and sometimes when fighting a battle like this one, that's more than enough.